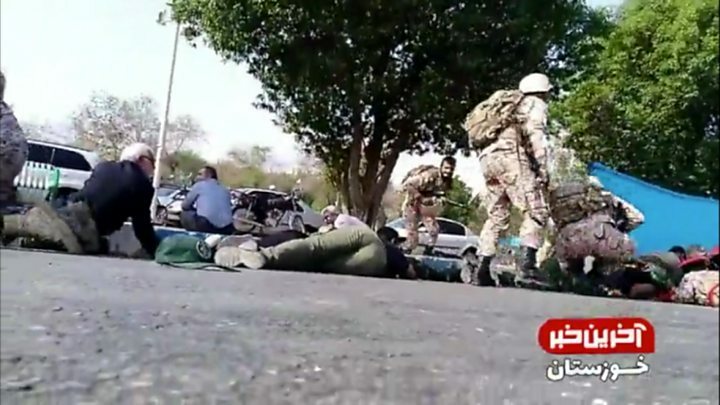 The US ambassador to the UN has urged Iran to "look in the mirror" for the causes of an attack on a military parade that killed 25 on Saturday. She was responding to Mr Rouhani's fierce criticism of the US, in which he blamed it for enabling the attack. An anti-government Arab group - Ahvaz National Resistance - and the Islamic State (IS) group both claimed responsibility for the killings. A video released by the Islamic State group's news agency, Amaq, shows three men in a car who appear to be dressed in Islamic Revolutionary Guards Corps (IRGC) uniforms, possibly on their way to carry out the shooting. President Rouhani said the "bully" US, along with Gulf states it backed, had enabled the attack. But the US has denied responsibility and says it condemns "any terrorist attack", while a senior official for the United Arab Emirates - one of the countries Mr Rouhani was thought to be referring to - called the accusations "baseless". "He's got the Iranian people... protesting, every ounce of money that goes into Iran goes into his military, he has oppressed his people for a long time and he needs to look at his own base to figure out where that's coming from," Ms Haley told CNN. "He can blame us all he wants. The thing he's got to do is look in the mirror." Speaking on Sunday, before leaving for the UN in New York, Mr Rouhani vowed that Iran would "not let this crime stand". "It is absolutely clear to us who committed this crime... and whom they are linked to," he said. He alleged that a Gulf country had supported the "financial, weaponry and political needs" of the attackers. He added: "The small puppet countries in the region are backed by America, and the US is provoking them and giving them the necessary capabilities." Mr Rouhani did not specify which "puppet" countries he was referring to - but his comments are widely thought to be directed at Iran's regional foe Saudi Arabia, and the UAE and Bahrain. Iran has previously alleged that Saudi Arabia supports separatist activity among Iran's Arab minority. In 2015, under then-President Barack Obama, the US and Iran reached a landmark nuclear deal - also signed by China, Russia, the UK, France and Germany - where Iran limited its nuclear activities in exchange for sanctions relief. More generally, the US is deeply suspicious of Iranian activity in the Middle East - including its influence in Syria and Yemen - and is an ally of Israel and Saudi Arabia. Mr Trump is chairing a UN Security Council meeting on Wednesday - and says the meeting will be focused on Iran. How will Trump treat Iran at UN?